Using a MIDI keyboard to control a virtual instrument or rack synthesizer is an effective way to improve the quality and aesthetics of your performance. A keyboard and a synthesizer are two separate units. A keyboard is the actual keys which resemble a piano, whereas a synthesizer produces sounds. While often built into a single unit, a synthesizer can exist separately from the keyboard as a rack or standalone unit. To play the synthesizer with an external keyboard, you need to set both up properly. Connect your MIDI keyboard to your sound source by USB or from the MIDI out of your keyboard to the MIDI in of your rack synthesizer. A USB connection handles both MIDI in and MIDI out data through a single line, whereas a unique MIDI port requires individual in and out connections. Power up your sound source and MIDI controller device. While all MIDI devices are designed for hot swap, it is always best to make your connections with all devices powered down to assure device recognition. Set the MIDI receive channel on your sound source by following the directions included in the device documentation. MIDI sends data on up to 16 simultaneous channels, and some MIDI devices can produce 16 unique patches, or sounds, at once, while some only produce one sound. Set the receive channel to either 1 or All for instruments playing melodies and channel 10 for drums or percussion. Set the MIDI send channel of your controller keyboard to the MIDI receive channel of your sound source by following documentation included with your MIDI keyboard. 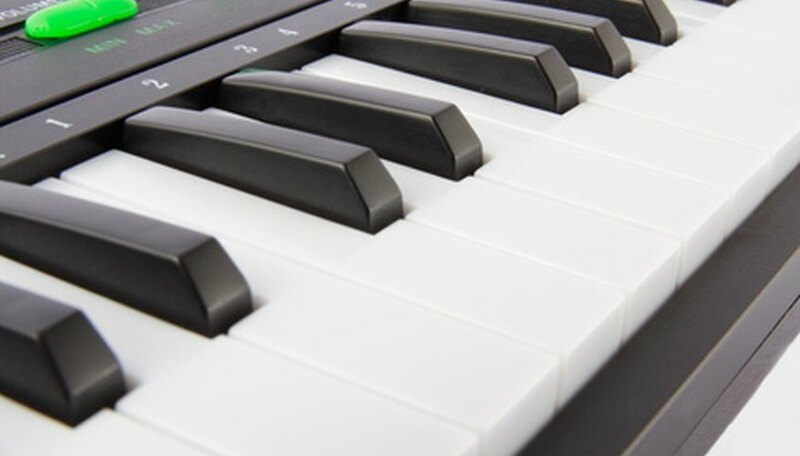 Some MIDI controllers have a channel option built into the interface, whereas others list MIDI functions above the black and white keys of the keyboard. In the case of the latter, simply press the "Shift" or "Function" key, depress the key assigned to "Program Channel" and select 01, 10 or Any from the labeled keys. Install all drivers and software associated with your USB-powered MIDI device before the performance. Most MIDI controllers allow you to edit other MIDI data from the keyboard including after touch, velocity, volume and program number. Consult your manuals. If you are using a USB device, remember to use an external power source such as a DC plug or batteries due to the limitations of USB in delivering steady power beyond 5 meters. Jason Parnell is a marketing director and professional writer. He attended Rutgers University for a Bachelor of Arts in musicology and analysis.